Happy New Year to all masters players and families. The 2019 Masters season is planned to kickoff on Saturday 23rd March (venue TBA). All teams should make contact to confirm availability for the first module. We look forward to catching up with all new and returning players at the first module as well as new teams joining for the first time. 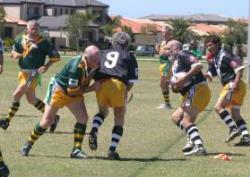 This years annual Tournament is planned for the Gold Coast in the week leading up to the NRL Grand Final, Friday September 27 – Friday 4th October. We will have a test match there on the Gold Coast. Attend the Grand Final, then have one game in Sydney before departing. A list of planned module dates is available on the websites under modules. Welcome to everyone who takes the time to have a look at our website. The video on the home page was done on our first tour to Great Britain and is used on the RFL website in the UK. I feel it really explains what Masters is all about, I hope you enjoy it.